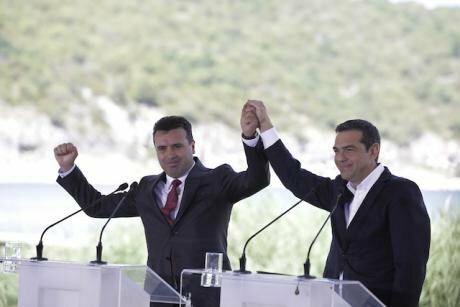 Greek PM Alexis Tsipras and PM of the Former Yugoslav Republic of Macedonia (FYROM) Zoran Zaev attend signing ceremony in the Prespes lake region of Greece, June 17, 2018.Dimitris Tosidis/Press Association. All rights reserved. The song became a hit and Greeks would be merrily singing it over the 90s. Yet, our national solitude has not been cloudless. It has forged a creeping authoritarianism in dominant political culture, that has led to silence through violence. So that when the infamous “name issue” arose, it did not just poison Greece’s relationship with its neighbour, but poisoned Greek democracy itself and freedom of expression within it. In April 2018, I wrote a book with Kostis Karpozilos titled ‘10+1 Questions & Answers on the Macedonian Question’ (Athens, Polis pub. ): our small contribution aiming to deconstruct the dominant myths that have haunted Greek public opinion on the matter of our neighbouring country’s name. When the book was published I called up a colleague at the university with whom I have a relationship of mutual respect, while disagreeing on the matter, and I asked him to write a few words about it without holding back his reservations. My colleague politely told me that he would not write something: “he did not want to praise, nor could he libel the book.” He could not honestly review the book, because he did not want to speak publicly regarding its virtues, which he acknowledged to me in private. He blamed our ‘national solitude’ for it. “Since no one understands us, it is no good to scratch our myths. Let them be!” he said. What went wrong and why have Greeks behaved in such a way? Is there, in fact, a dominant political culture favouring an underdog nationalism in Greece, as dictated by a contemporary and still dominant version of Balkan orientalism? This thesis is supported by the theory of cultural dualism, according to which Greece has always been a stage for competition between two tendencies: national introversion and a modernising rationalisation project. Despite the dualist assumptions, the government’s “modernisation” plan for a “strong Greece” during the frantic growth of the ‘90s had no serious problem with compromising over the denial of a people’s name, although the overall “name issue” was not part of the political culture of Greek modernisers, such as then Prime Minister K. Simitis (1996-2004). This was incorporated, however, with no difficulty, because it did not hinder the strategies of economic expansion and political dominance in the Balkan hinterland. Greek capitalism could perfectly well assume a hegemonic role in the Balkans after the end of the cold war despite the name issue. To put it bluntly, it is exactly Greece’s micro-imperialist arrogance vis-a-vis the “poor Balkan fellows”, that fed Greek nationalism in the 90s and created the teratogenesis of the so-called “name issue”. So cultural dualism cannot explain why Greece responded in the way it did in 1991, when its neighbour simply decided to stop calling itself the “Socialist Republic of Macedonia”, drop the “Socialist” part and keep the rest: “Republic of Macedonia”. After all, these people were already referred to as Macedonians before that: long before 1991, even before 1944, the year when their State was created. Abroad, Greece’s position seemed inconceivable even to those well disposed towards the country. People who love Greece and who have stood by its side during difficult times, such as the years of the current crisis, have given up over the “name issue”... “I recall” writes Douzinas, “that the incomprehensible Greek denial of the name used by everyone in academic conferences raised eyebrows and ironic comments”. I guess few Greeks have discussed the Macedonian question in public fora over the last 25 years without being faced with those “raised eyebrows”…. Yet, what seems unreasonable is never inconceivable. Even the most unreasonable things in the behavioural sphere of nations, make some sort of sense. In our case, seeing the Greek model of state formation as part of the historical legacy of the nineteenth and twentieth centuries is the path to understanding. In the early twentieth century we can identify the first stirrings of an indigenous national consciousness, of Macedonianism in the Balkan hinterland, which, with the gradual demise of the Ottoman Empire fell prey to the young, robust nationalism of the states: “about nine thousand people arriving at Ellis Island between 1897 and 1924 declared their ethnicity to be Macedonian”. Until the established defeat of the Bulgarian national movement in the region, the idea that some Slavic-speaking peoples of Macedonia – that were not subjected to the Bulgarian Exarchate (the Bulgarian national church) – would turn the place-name “Macedonian” into an ethnic marker was probably convenient to Greek intentions. In one word, unlike what is commonly believed in Greece even today, the Macedonian nation was not Tito’s product. When, later, the borders were established after the Second Balkan War (1913) and Greece had to compose its own national narrative as a single dominant state, the existence of a Macedonian minority became a structural problem for the Greek unitary national idea. In Greece, as in France for example, state vocabulary has no room for national minorities. This is not because it is racist and violent, but because it is deeply unitarian. In principle, national minorities are unimaginable, inconceivable. Like French or Turkish citizens, Greek citizens cannot but be nationally Greek. There is no space for something else. This is not because it is racist and violent, but because it is deeply unitarian. In principle, national minorities are unimaginable, inconceivable. The French revolutionary model of “one state, one nation, one language” is complemented by one more demand that does not exist in France: One religion. Those who are Greek Orthodox Christians cannot be anything but Greek. Even the name of the religion, in twentieth century terms, indicates national belonging. The result is that if someone is Greek Orthodox, then (s)he must be Greek. Slavic-speaking Macedonians were therefore, from the very beginning, the ideal exception that breathed life into the unitary rule. They believed in the Patriarchate, whereas they did not belong to the Greek nation. Some years later, the enlisting of most of the Slav-Macedonian minority in the Communist Party during the Greek Civil War (1946-1949) was the decisive act of their national “unworthiness”. With the end of the civil war and their expulsion from the territory, Greece denied their existence by refusing that such an identity even existed. The language was simply banned. Persecution of the remaining Slav-Macedonians in the post-war period until the end of the Cold War (with a gradual relaxation during the 80s due to the Socialist Party in power) was part of a daily agenda. It is only in 2000 that the first history book was issued in Greece documenting this situation! So, just when Greece had almost completed its project of forceful assimilation of the Macedonian minority within its borders, in 1991 a real bombshell went off: a “Republic of Macedonia” next door! Now, a sovereign state has the name that Greece had done everything it could to erase for the biggest part of the twentieth century. Greece had succeeded within its own territory, but the battle couldn’t be fought beyond it. Ever since the creation of Yugoslav Macedonia in 1944, Greece has been burying its head in the sand. It wouldn’t see, because it could not stand to face it. This strategy was also convenient because the Cold War “Athens-Belgrade” axis had to be preserved at all costs, particularly for NATO plans. The Macedonian Question remained a thorn in Greece’s side, however, that caused a pain Greece was prepared to tolerate due to other more important needs, both regarding itself and the entire West. In conclusion, Greece’s reaction to the use of the name “Macedonia” by the former Yugoslav Republic seems unreasonable: but it is not, after all. On a first level, it obeys the norm of a classic authoritarian assimilatory state model, but along the way it was derailed by its own ostrich-like denialism, and then entered into the sphere of the “inconceivable”. Questions on Macedonian irredentism and the ‘name’ issue. Could it all possibly be in the Greek imaginary? Are Greek fears regarding Macedonian irredentism well-founded? One might assume that the smaller or poorer entity (whether a State or an economy) could not possibly threaten the bigger or richer one motivated by irredentist claims. We won’t agree with this. The small(er) Greece had historically irredentist claims vis-a-vis big(er) Turkey, for example. The fact that the Republic of Macedonia is smaller and poorer in relation to Greece does not suffice to quell possible Greek concerns. If there is irredentism north of the Greek borders, and a minority in Greece that is negatively disposed towards belonging to the country territorially, then it is of little importance if Greece has 500 aeroplanes and its neighbour one. The goal is not to go to war so as to measure our power against each other. Yet, irredentism is a marginal political ideology and concerns a small portion of Macedonian nationalists. It is not absent, but it is marginal. That portion has no capacity for political leadership in future plans in the region. On the contrary, as is usually the case, the further they find themselves, the more nostalgia may be poisoned by the toxic gases of irredentism. Large portions of both the Greek and Macedonian diaspora have taken an aggressive lead in the conflict regarding the name in the safety of their new nationality. Macedonian irredentism, therefore, is much easier to find in Melbourne or Toronto than in Skopje itself. If we assume that part of these fears is indeed well-founded, did the Greek policy of refusing to use the name “Macedonia” to this day allay or intensify those fears? If the answer to the first question had relatively complicated historical and political shades to it, we can be certain that the answer here is much simpler. Greece’s political stubbornness regarding the name “Macedonia” did everything it could to intensify the insecure reflexes of a nationalism whose identity was questioned so intensely by the majority of its neighbours. The territory of the country is questioned by Albanian separatists, the nation is considered “Bulgarian” by the Bulgarians, and the state was anything other than “Macedonia” for Greeks. The wound is not easy to heal. The worst part is that this policy intensified the self-victimisation of Macedonian nationalism, resulting in every ill fate that has befallen the country being attributed with ease to foreigners. Resorting to conspiracy theories that drastically poison discussion, unfortunately, is an established political behaviour in Macedonia. To this day, as people are unable to explain Greek denial, they attribute it to a plan to dismember their homeland. They cannot conceive of anything else. And yet, in strictly geopolitical terms, the existence of this state is a godsend for Greece, as it stands in the way of the nationalism of all neighbours (Albania, Serbia, and Bulgaria). As a Greek International Law expert said, “even if it did not exist, we would have to invent it”. To the degree to which irredentism fears are valid, would the use of the name “Macedonia” be a condition for the possible success of their threats? The only case of a state that changed its name because other states wished it to do so, was that of Austria in the twentieth century. However, the renaming was the result of a war and the enforcement of an international alliance. The answer to the question of whether the choice to change Austria’s name was just, was found in the result: the change of the constitutional name did not stop the country from jumping onto the Nazi bandwagon a few years later. Since 1991, no matter where Greek diplomats have found themselves, they have been crying: “Irredentism exists through the name itself. If the name is removed, the weapon aiming at the populations that identify through that name will also be removed.” If the term “Macedonia” is removed, the problem disappears. Through the use of this name, geopolitical instability and claims on the historical right to “Macedonianism” start to be nurtured. If the name, magically, disappears, then the quiver of irredentism is empty. However, as the Austrian experience of the Inter-war shows, this view is subterfuge. If there is a problem, it is not in the name, but in the geopolitical matters at stake, which may remain in hibernation, regardless of whether the name “Macedonia” is used. If, for example, they wanted to change the borders to include the “irredentist Macedonians”, they would continue to do so, even if they had been forced to called themselves something else. This makes the Greek policy regarding the ‘name issue’ futile, among other things. Even in the most heartlessly cynical terms of political expediency, nothing guarantees the fact that forbidding the use of a name disarms the irredentist intentions of a nation, should they be present. In conclusion, the Greek position on the infamous ‘name issue’ is not that incomprehensible after all. However it has been proven both unfair and politically pointless. That is why the Prespes Agreement is a great step forward. One less problem for such a region is of major importance for all! Music by Marios Tokas, lyrics by Philippos Grapsas and sung by a really great singer, Dimitris Mitropanos, on the record by the same name. Neither of the two was ever considered a Greek nationalist. Mitropanos himself was in fact a communist. The song’s lyrics are still considered absolutely mainstream. The book is now available online, free of charge in English, Greek and Macedonian. Cf. Cultural Dualism and Political Change in Postauthoritarian Greece, Nikiforos Diamandouros, Athens, Alexandria Pub. 2000. Only the European extreme right justify Greece’s position, firstly, because it applauds when the strong impose a name to the weak, and secondly, because they see a racial conflict here between “Greeks” and “Slavs”, in which they can easily take the side of the descendants of ancient Greek glory. With the exception of the Far Right, the Prespa Agreement was welcomed almost unanimously, with the well known exception of Russia, exclusively related to geopolitical reasons. Meaning, subject to the Patriarchate of Constantinople. T. Kostopoulos, The forbidden language, Athens, Mavri Lista, 2000. In 1918, after the defeat of Austro-hungary in WWI, the Austrian parliament declared a new state with the name “German Austria” (Deutschösterreich). The Allies reacted, saying that the new state would bear the name “Republic of Austria” (République d’Autriche). The name Deutschösterreich implied territorial claims on areas in Central Europe (mainly Czechoslovakia and Yugoslavia), which were inhabited by German-speaking former subjects of Austrohungary and it supported intentions of a future Austro-German union, which was reasonably seen as a threat. In the end, with the international Treaty of St. Germain, the name imposed was “Republic of Austria”. Thus, the Austrian Constitution changed, by assigning the new name for all use within the country (erga omnes) and by removing from the constitution any references to a future union with Germany.